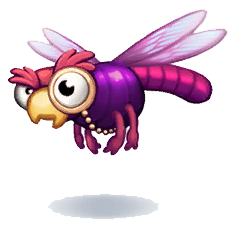 Monocle Monicas are insectoid enemies capable of flying, seen in Donkey Kong Country: Tropical Freeze. They can only be found in the levels of Lost Mangroves, starting with Shipwreck Shore, where they appear in small alcoves with turf-covered walls. Monocle Monicas resemble dragonflies, given their horizontal wings and overall physical constitution, which looks like a caricatured dragonfly's body due to their swelled thoraxes, short abdomens and tiny legs. They feature a beak and an elegant monocle worn on the left eye, hence their name. Monocle Monicas display grumpy and concentrated looks. As in their concept artwork, Monocle Monicas were originally depicted as having small insect mandibles instead of beaks. Nevertheless, their mellow yellow color remained consistent. The general behavior of Monocle Monicas involves flying in set paths. Unlike Hootz (flying enemies from the same game), Monocle Monicas have a much more dragonfly-characteristic method to fly, as they hover in one place in midair with their wings rapidly swinging before quickly shifting to another close area. However, flying patterns may vary from an individual to another: some Monocle Monicas fly between two positions, other between three in a row, while other follow rectangular trajectories. Monocle Monicas are quick and can damage the player-controlled Kong easily. The Kongs can only take out these enemies from the top, with a single stomp. Although this is preferred to attack a Monocle Monica, other methods, like throwing objects, can be approached. This page was last edited on August 24, 2018, at 22:45.